Ireland has a long association with mining. Records of mining date back to the Bronze Age (ca 2000 B.C.) when southwest Ireland was an important copper producer and alluvial gold was also worked for the production of gold artefacts. Although iron was worked from the eastern half of Ireland during the 16th and 17th centuries, it was not until the late 18th and 19th centuries, that the Irish metal mining industry really flourished, triggered by the needs of the Industrial Revolution in Britain. During this period, almost every county had at least one metal mine. Copper mining boomed, as did lead-silver extraction from numerous high grade, low tonnage vein deposits. Fortunes were made and lost, not least during the gold rush between 1795 and 1830 at the Gold Mines River (Co. Wicklow), where an estimated 7-9,000 oz of gold were extracted from alluvial gravels. This period also witnessed the most important episode of coal mining, slate quarrying and pyrite production in Ireland. Today, Ireland is internationally renown as a major zinc-lead mining province. Over the last 40 years a string of significant base metal discoveries have been made, including the giant ore deposit at Navan (>70Mt). Zinc-lead ores are also currently exploited from two other underground operations in south-central Ireland: Lisheen and Galmoy. The combined output from these mines, make Ireland the largest zinc producer in Europe and the second largest producer of lead. In addition to metal mining, Ireland has a rich heritage of industrial mineral and coal extraction. Both gypsum and brick shale are currently worked from open pit operations in Co. Cavan, whilst dolomite and fireclay are exploited from two sites in Co. Kilkenny. Other industrial minerals previously extracted in Ireland include barite, dimension stone, phosphate, silica sand and slate. 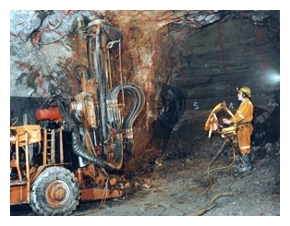 During the early 1980s, the Ballynoe barite deposit was amongst the top 5 producers in the world. Coal was worked in Ireland as recently as the early 1990s, although it was most extensively worked in the 19th century. The large demand for road and building construction aggregates in Ireland supports a thriving quarrying industry. Today crushed rock and sand and gravel are exploited from in excess of 400 sites across Ireland.